LAST DAY TO ENTER: Win a ZumZum balance bike worth $249! It’s every kid’s dream come true — a brand new bike! We’re offering the chance to win the coolest new balance bike on the market to one lucky Inhabi-tot! The ZumZum all-terrain balance bike accommodates kids from age 18 months up to four years-old — and it can be ridden by kiddos indoors or outside! This sleek, lightweight bicycle can be taken on any adventure, and the ergonomically designed seat and natural suspension ensure safe and comfortable ride time. Read our previous coverage of the ZumZum Balance Bike to learn all about this sweet ride’s amazing features. And learn how to enter to win after the jump! 1. Follow Inhabitots on Pinterest. 2. Submit a comment to Inhabitots below with why you want to win this bike. so we can find and follow you! 3. 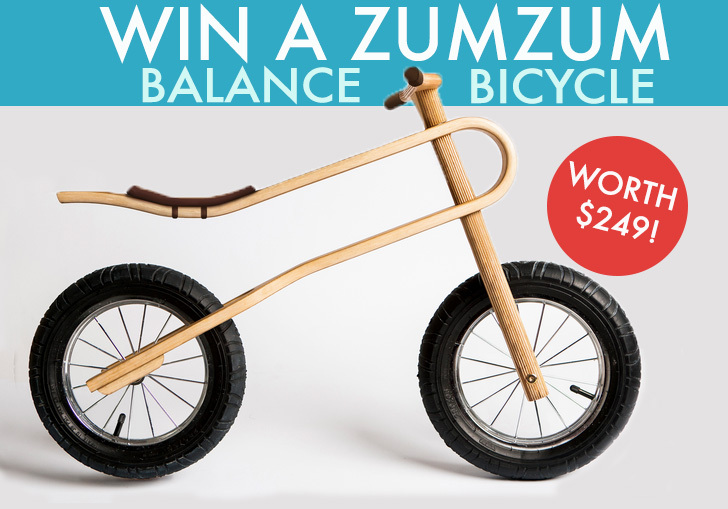 Our editors will review all submissions and select what we feel is the most compelling entry to win a ZumZum Balance Bicycle! The deadline for all submissions via comment below is January 31, 2015 at 11:59PM EST. Today is my daughters 2nd birthday and she has been itching for a bike to ride. This would be perfect for outdoor use. We love to play in the backyard with her 4 year old brother any day he isn't in school. Our twins just turned two and though I dread them riding bikes here in Brooklyn, I am really excited about it too. I can't air to get them hooked on biking and a cool, non-toxic bike to learn on!!! That would be awesome and if we won one of them I'd only have to buy one! would love for the 2 yr old as she watches her old sibling on her bike with wonder! Pinterest handle stevezitur I would love to win this, I currently don't have, nor am expecting kids, but I have a niece and a nephew who are both in the right age range to be able to use this. They currently don't have a bike, so I would love to be able to give this to them so they can start learning and be on their way. pablocordero One of the resolutions I made when becoming a father was to promote physical and outdoor activities for my daughter and teach her by being an example about what it means to have a healthy body and mind through exercising and eating healthy. I think it is really important especially now when there are so many gadgets and marketing gearing them towards the exact opposite. Cycling is not only an excellent exercise, it is also fun and something that can be practiced by the whole family. Moreover, I think, for the kids being able to do it on their own marks an important life milestone and a transition into being a 'big boy' or 'big girl'. I would love this to be my daughter's first bike, it's beautiful, original, I am sure she will always remember when she learned to cycle and how her first bike looked like. handle: pablocordero I would love this to be my daughter's first bicycle, it's beautiful, fun and original. One of the goals I set for myself as a dad was to teach my daughter the importance of keeping oneself healthy, by exercising and eating well. Cycling is an excellent exercise, it allows kids to develop new abilities and get outdoors, which they do now less and less. Moreover, being able to balance by themselves and ride a bike is almost a life milestone, a transition into being a 'big boy' or 'big girl'. It is also a great activity to do for the whole family. Thanks for the opportunity to win this bike, I am sure it will be part of great memories. I would love this product. I love these Bikes.....so much smarter than pedals and the dreaded training wheels!! My grandson has cystic fibrosis and it is extremely important for him to exercise everyday to build his lungs and keep him healthy. What an awesome way for a young child to be in control of the bike rather than the old way. I would think it would encourage them much more because they can be successful like the big kids. How wonderful he won...thanks for reading. I've been wanting to get one for our son! He just turned 3 and I think this would be fun for him. It looks safe and sturdy and is so unique looking! Thank you for the chance! J'aime ce produit simple, beau et surtout qui permet au enfant de bouger, d�couvrir le plaisir de rouler ! Brilliant idea to eventually graduate to a regular bike..It gives the kids confidence because they don't need the help of an adult or older kid to manage the bike..
melissawiz - followed on Pinterest and shared on FB With this bike Mikey would be the coolest kid on the block! this is an ingenious design/concept...what a great way to get kids used to 'balancing' and pedaling. My pinterest handle is Alan Greenspan. My son is a year and a half young, his name is Yadel Shalom, meaning peaceful hand of God, or the hand to peace. I would rather you give this bike to a refugee camp. Or sell it on eBay and donate it to 3 organisations, one being Sustainiverse.org. Thanks. My grandson is gaining great confidence using his and I know that my grand daughter would also greatly benefit from one of these. I like the use of wood throughout and the simple design. Pinterest handle: mbethkelley. I would love to win this bike for my 2 year old, who loves wheeling around our neighborhood and the school ground near our house, but hasn't quite got the pedaling part mastered yet. I used to be an avid bike commuter (and hope to return to it soon), and would love to pass my love of cycling on to my kids. And just about the time my other little one is graduating out of this toy, my now 5-month old will be able to use it, so it will receive many years of love in our family. Wow this is such a great giveaway I'm a Occupational therapist assistant and this would be so for my kids with balance, vestibular, and coordination issues. My three year old would love this! My Pinterest handle is @jayaline. My niece would love to have a bike like this! My niece would love to have a bike like this! Her sister learned to ride with a balance bike. My son already cycles an imaginary cycle whenever he sees me and gets excited. I would love to see him using a zum zum to cycle! I follow inhabitots! http://www.pinterest.com/fleali/ My daughter is in a wheelchair fulltime and her 21 month old son has no wheels of his own to accompany her. The ZumZum is a beautiful and healthy set of wheels! http://www.pinterest.com/jorjahb/ My boy would love this bike, and his father and I would love it too. He is three, will be four in June, and we would love to give it to him for his birthday. He lost his baby sister last year. While no object could ever make up for that loss, we aim to give him objects of joy in his life to fill in the gap that was created when he lost his playmate. And we want those things to be both beautiful and functional, as well as beneficial... not just any old toy. www.pinterest.com/lboege Both my husband and I mountain bike and would love our 16 month old to learn how to bike with us! We love Balance Bikes! THank you ! Mommy2rylie on Pinterest Wow, what an amazing chance this is!! My daughter Rylie will be 3 In a few months and doesn't have a bike. This would be absolutely perfect her her because she is growing so so fast and the fact that is bike can be adjusted and can grow with your child is only one of the features that make is so great. She became a big sister last year and she deserves a fun new toy that could teach her to ride her bike. Then when she's too big for it she could pass it down to her little brother!! This is the best sustainable bike I have seen in a long time. I have a nephew that would love this and he can pass it on to his little brother when the time comes. Then it can be passed on to the next family to be loved. Products like these can be loved then shared, which makes them priceless. csosalla: I would love to win this. Our nephew just turned three and it would be great to teach him how to ride a this. I've been reading the reviews online for this bike for quite some time and it's impressive! I know it would make his eyes light up to see this present and it would be great bonding time for us as his aunt and uncle! This is the cutest bike I've ever seen! My daughter's 3rd birthday is in April and we can't wait to get her started on a balance bike! This one is just perfect! Hello I have following on Pinterest frugaluser Why I want to win. I just had my 4th baby my oldest is 4 1/2! And I would love to be able to give such a cool toy to my kids. Since having 4 kids so close together doesn't leave a lot of wiggle room In the budget winning 1. Would be fantastic. It is very hard for my to find toys that the older 3 18 months to 4 could all use and this seems to fit the bill. They would hopefully 1st learn how to share the bike and then master the Balance bike. I am sure with this bike they would be the envy of the street! I would like to win this bike for my son. I think he would like this a lot. My pinterest username is Jennifers Deals. Pinterest follower- kirbycolby I would love to win this for my son and daughter. I have (almost thrown) in the towel and surrendered to the gender specific, cartoon character encrusted, light-up plastic junk that lines most toy shelves. Seeing things like the ZumZum bike gives me hope. I know my 3 year old daughter would enjoy the safe, comfortable ride this bike offers this summer, especially since she doesn't have the coordination to pedal yet. Since the ZumZum is cool looking all on its own, without a million pink princess decals, I look forward to my 9 month old son using it as well in a few more months. Pinterest: http://www.pinterest.com/jbang0331/ I would love to win this for my daughter! Even with training wheels on her bike, she just can't grasp the pedaling yet and so wants to ride around with her big brother!! It would be a good way for my son to learn to ride a bike. Pinterest handle is maggiep48 I would love to win this for my 2.5 yr old grandson. He is very active and loves to be outside. When he was born he had to wear a body brace because his hip didnt form perfectly. Now he running and playing like nothing was ever wrong. I want him to learn agility and balance. This bike would help so much with that. Plus I would rock as the Best nana Ever! :) Thanks for the chance! http://www.pinterest.com/michylou/ I would love this for my youngest daughter! My oldest has a balance bike and the little one wants to do everything her big sister does. They would be a dynamic balance bike duo! perrinia- All the great new bike parks around aren't the best for training wheels (as we are finding out the hard way). So how else do you show your 3yo how awesome bike riding can be? With a balance bike-so he can jam with the Big Boys and Big Girls. My son and daughter would LOVE the Zum Zum bike! I have wanted to buy them one for so long!!! Thanks for the chance to win one! Simple, ergonomic, eco-friendly, and cool! It doesn't get any better than that...the kids would be totally on trend with this bike! I would like to win this bike because I know a child in need would love it! I am following on pinterest. I would love to have the ZumZum Bike to teach here in Brazil what we can do with a clever and a green idea! I will give the bike to my nephew! Thanks!!! my kid would love it!! https://www.pinterest.com/casael/ my kid would love this!! What a beauty; I would like to try it myself, if they ware bigger. So nice. http://www.pinterest.com/madarchitectpl/ Beautifull design. Nice katchy name, grate idea for the U shaped frame and the nicest material in the world - wood. Nothing more to ad. Simply less is more. Bravo ! My brother passed away suddenly from a stroke 4 months ago. He was an avid triathlete. In his honor, his 5 children have been running in monthly 5K races. The 3 older children received new bikes for Christmas. Now the 2 younger girls want to bike too to remember their dad. Winning this would help to give the youngest a sweet present to help her feel closer to her siblings and keep memories of her father close to her heart. Thanks for the giveaway. I'd love to win this for almost 12 month old only grandchild Emma. I'm sure she'd be happy to wait till she's 18 months old to tackle it. I want this bike for my neighbors little girl. She comes over all the time to help me with my garden and do small chores and I would like to get something nice for her. I'd like to win this for my granddaughter to learn how to ride a bike. And it looks like fun in the snow !! Pinterest is poordaddy. Thank you for the chance to win this !! Didn't know if I needed to tell you my Pinterest handle is my name ,Darcy Reaver. I have some sweet neighbors whose boys are darlings, 3 and almost-6. One has a wooden bike, and it would be wonderful if the other did as well! Their loving parents impart a love-the-environment message to their children in all they do, and their children reflect those views themselves. If I won this, I would give it to the eldest child! I'm zephyrgrrl on Pinterest. My daughters are 20 months and 4 and would both love this ! Love to give my kids any reason to get outside and stay active! This is totally cute! Would love to have this for my niece. Great beginner nike for all the little ones. We would love to win this bike. our son is 2 years in April and that would be a great gift for him. and we can advertise this fun cycling in the Netherlands. It's every kid's dream come true -- a brand new bike! We're offering the chance to win the coolest new balance bike on the market to one lucky Inhabi-tot! 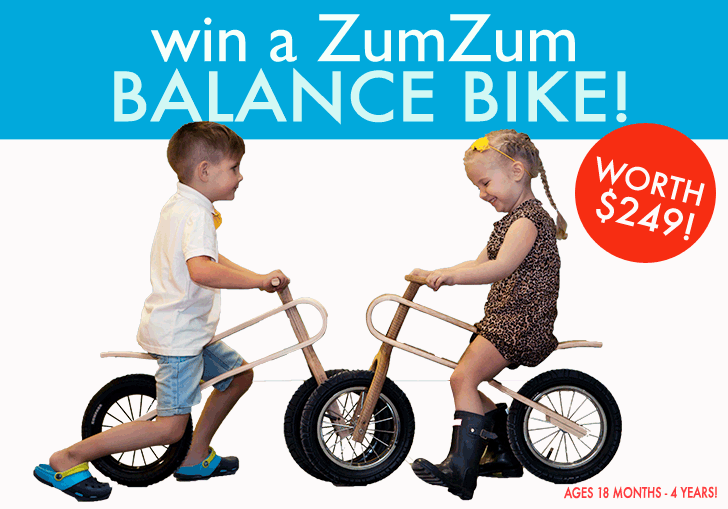 The ZumZum all-terrain balance bike accommodates kids from age 18 months up to four years-old -- and it can be ridden by kiddos indoors or outside! This sleek, lightweight bicycle can be taken on any adventure, and the ergonomically designed seat and natural suspension ensure safe and comfortable ride time. Read our previous coverage of the ZumZum Balance Bike to learn all about this sweet ride's amazing features. And learn how to enter to win after the jump!